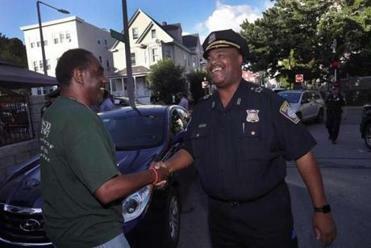 William G. Gross greeted residents during his last tour of Roxbury in uniform before being sworn in as Boston’s first black police commissioner. There were early signs, friends say, that Willie Gross, as a teenager on Esmond Street in Dorchester, could grow up to be a police officer. Like the time he chased down a man who snatched a woman’s pocketbook in 1970s Boston. Or the fact that he was the first to go home when his mother called. Or that he would scold peers for stealing a bike out of a backyard or for pocketing goods at the corner store. As Gross is set to be sworn in Monday as Boston’s 42nd police commissioner, those who recall his upbringing and followed his career say that his historic appointment as Boston’s first black police leader was years in the making. “It gave me a sense of pride, because that’s where he belongs,” said Stenard Ross, who played football with Gross when they were teens on Esmond Street. The superintendent-in-chief will be promoted during a ceremony at Morning Star Baptist Church in Mattapan. Gross, 54, is a mainstay at community events, always in uniform and willing to take photos with strangers, sharing a hug if they let him. In a minute-long video at the Boston Marathon starting line earlier this year, posted on YouTube, he embraced a stranger, praised New England weather, and explained how Bostonians pronounce chowder. By the way, he pointed out, Boston had the first police department in the nation (1838). On Twitter, he shares pictures of community meetings and reading lessons with schoolchildren. Want to be his Facebook friend? Sorry: He’s already maxed out at 5,000. Those who know him attribute his personality to his close relationship with his single mother, who is known for being social and engaging, particularly at church. He is the middle of three children, and the family stayed close to its Boston church after moving from rural Maryland when Gross was 12. Within seven years of coming to Boston, Gross graduated from Boston Technical High School (now the John D. O’Bryant School of Mathematics and Science) and joined the police cadet program, and two years later he was a patrolman — the start of a career that would bring him to the police gang unit and training academy, to overseeing the night shift, and to chief superintendent. Gross will be sworn in at the Morning Star Baptist Church, the church of his mother, Deanna, for 35 years. People who have met him in the community would remark, “He’s just like his mom,” said the Rev. Mark V. Scott, of the Azusa Christian Community, who works with police as the head of a city trauma team that responds to violent crimes. Gross will have challenges leading a 2,200-member department, at a time when police and community relations have soured in other cities in the country. As the city’s first black commissioner, he will also helm policing in a city that still bears scars of racism — a point that Gross acknowledged, while noting that Boston’s reputation has improved. William Gross wants to meet with community members and district commanders after taking office. “Everyone should be at the table,” he said. 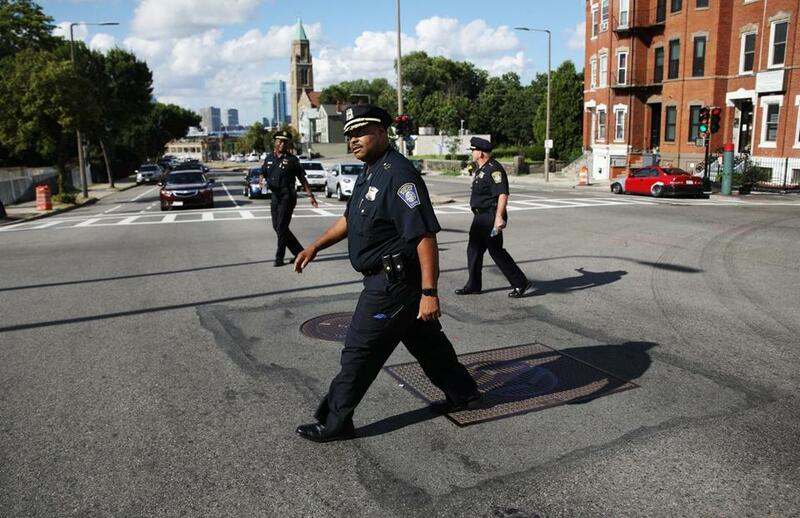 In an interview Friday evening, as he strolled with Peace Walkers through Roxbury — his last tour in uniform before he is sworn in — Gross reflected on the “village” of mentors that nurtured him through the years, saying he wants to maintain that same sense of community for other youth. He said he has invited a group of youngsters to his swearing-in ceremony. He called “senseless youth violence” his greatest concern, as the number of fatal shootings has crept up in recent years following a 15-year-low in 2015. This year’s homicides are on pace to top last year’s, even as overall crime has declined. Gross would not disclose any initiatives or strategies, saying he wants to meet with community members and district commanders first. “Everyone should be at the table,” he said, a frequent mantra of his. And he said he had not yet picked his superintendent in chief, who would serve at his side, as he has served for the last five years for outgoing Commissioner William Evans. “Whoever the chief will be, will be hard-working, they will be well-known in the department, they will be well-respected in the community, that’s who the chief will be,” he said. It was not immediately clear how much Gross will be paid, but Evans had a $230,000 salary in 2017, according to city records. Gross, who has a longtime girlfriend, has not lived in Boston recently, but he told the Globe he plans to move from Milton into the city within the next six months, as required by city ordinance. According to those who have followed his career, Gross’s early decisions, including the choice of his command staff, will best reflect his strategies moving forward. “As long as he is allowed to run the department without interference, as long as he is able to pick his staff and pick the people who will do the job for him like he wants it done, I think he’ll do fine,” said Billy Celester, a former Boston police district commander whom Gross named as a role model early in his career. Celester and his wife lived next door to Gross on Esmond Street and encouraged Gross to become a police officer. “If anyone can handle those expectations, the pressure, that’s Will,” said Stenard, the friend from Esmond Street. He said he moved to Dorchester around the same time and age as Gross, but Stenard was seen as an outsider because he emigrated from Trinidad. He would get jumped in the street. Gross would step in. “He looked out for me, my family,” he said. Troy Boggs, who also grew up on Esmond Street and was two years older, recalled the incident in which a woman had her purse snatched. The woman was white, the suspect was black, it was the throes of the busing crisis, and Boggs wasn’t quite sure what to do. But Gross gave chase, and Boggs followed. The man dropped the purse and kept running. 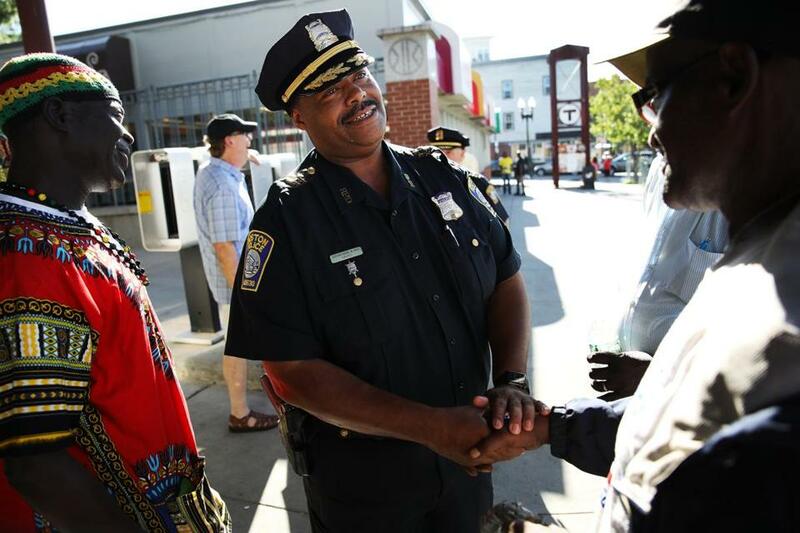 During the Peace Walk Friday, in and around Dudley Square, Gross connected with commanders and ministers, community leaders and residents. He joked that he still needed to pick up some suits, something he was not accustomed to wearing as a uniformed officer. He hugged anyone who would take a photo with him, saying he needed all the blessings he could get. It seemed everyone wanted to meet the new commissioner. “I’m so excited, I saw you on TV,” said Eva Coakley, a retiree and neighborhood resident for more than 40 years, as she waited at the top of Regent Street, preparing to pass out water bottles. “You know I’ve been knowing you a long time,” she said. Milton J. Valencia can be reached at milton.valencia@globe.com. Follow him on Twitter @miltonvalencia.